There's much to tell about our new VX®-1, but here's how the story ends: No other scope in its class comes even close to the quality, performance, and value of VX-1. With our revolutionary Quantum Optical System, with lead-free glass and Multicoat 4 lens coatings, the result is up to 92% total light transmission, and a sight picture that is incredibly bright, clear and razor sharp. Better have one atop your favorite rifle. Leupold VX-R 1.25-4x20 Matte Riflescope increases your chances for a sure shot in various lighting situations. The VX-R riflescope series from Leupold delivers a rugged industrial design with FireDot illumination for unprecedented accuracy. 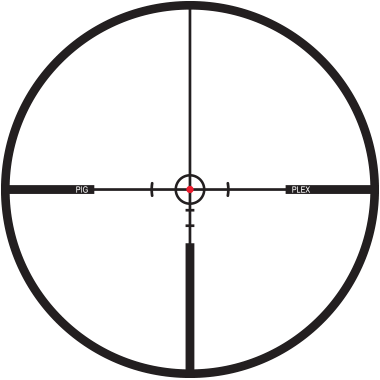 The Leupold VXR 1.25-4x20mm Rifle Scope with Fire Dot reticle utilizes fiber optic technology for a bright, clear, "daylight" aiming point in the center of the reticle. The illuminated firedot can be adjusted for brightness by simply pressing a button. The Leupold Fire Dot will blink when the highest brightness is reached or when the lowest brightness is reached. With a durable matte finish and the quality craftsmanship Leupold Riflescopes are known for, Leupold 1.25 - 4 x 20 VX R Riflescopes will deliver results on every hunting trip.